It's too little, too late, thought Jivali Bai and her husband Ram Chandra Meena from Rajasthan’s Gyaspur village when they received Rs 30,000 in July this year as compensation under the Family Planning Indemnity Scheme (FPIS). “I had undergone sterilisation in 2003, after a doctor from the district health centre at Pratapgarh said it is a permanent method of contraception. By then we had two children and caring for them was becoming difficult,” recalls Jivali, who works as a labourer along with her husband. The procedure, which involved tying or clipping fallopian tubes through a minimally invasive surgery to prevent eggs from reaching uterus for implantation, required her to stay in the hospital for two days, shell out Rs 500 and forgo wages for over a week. But three years later, she learnt she was pregnant. “We were shaken by the news as raising a third child was beyond our capacity,” says Meena. Though the government assures Rs 30,000 under FPIS in case sterilisation fails, the couple made peace with their fate as they did not know who to turn to. The third child, Meera, was born at the hospital where Bai had undergone sterilisation. She received the compensation 11 years later after non-profit Prayas persuaded her to move the Rajasthan High Court. “Some 47 women from Rajasthan and 23 from Madhya Pradesh have moved court in the past two years after we informed them that they are eligible for compensation under FPIS. Twenty-four of them have been compensated for undergoing mental agony and financial loss due to unwanted pregnancy,” says Chhaya Pachauli of Prayas that works on public healthcare. Pregnancy after tubal ligation, or tube ctomy, is also fraught with potential health complications, says Devika Viswas of non-profit Health Watch Forum in Bihar and Jharkhand. It often results in ectopic pregnancy or pregnancy in the fallopian tube. During her visit to Bihar’s Bhagalpur district in 2013-14, Viswas came across 20-odd cases of failed sterilisation in one Nath Nagar village. “None of them knew that they had to seek compensation from the government if they got pregnant,” Viswas adds. Sulakshana Nandi, part of people’s health movement Jan Swasthya Abhiyan- Chhattisgarh, says failure of sterilisation is common across tribal areas of the state where the government used to regularly organise mass sterilisation camps. But very few cases of failure—only 10 in 2016-17—find a mention in the government records. Experts say such cases expose serious flaws in the government’s population control policy. One, explains Viswas, most women who opt for sterilisation are poor, unlettered or have little education. “This is particularly the case at sterilisation camps, which have been organised across the country despite a ban by the Supreme Court in 2016,” says Pachauli. While the sterilisation procedure requires them to sign consent forms, they cannot possibly give “informed consent”. “Most women we meet during our visit to villages do not even know that they have to keep the certificate provided by the sterilisation centre for future use,” she says, adding that the certificate is required for claiming indem nity in case the surgery fails. Counselling and explaining post-surgery risks take a backseat as hospitals remain understaffed and doctors perform dozens of tubectomies within a few hours, says Viswas. 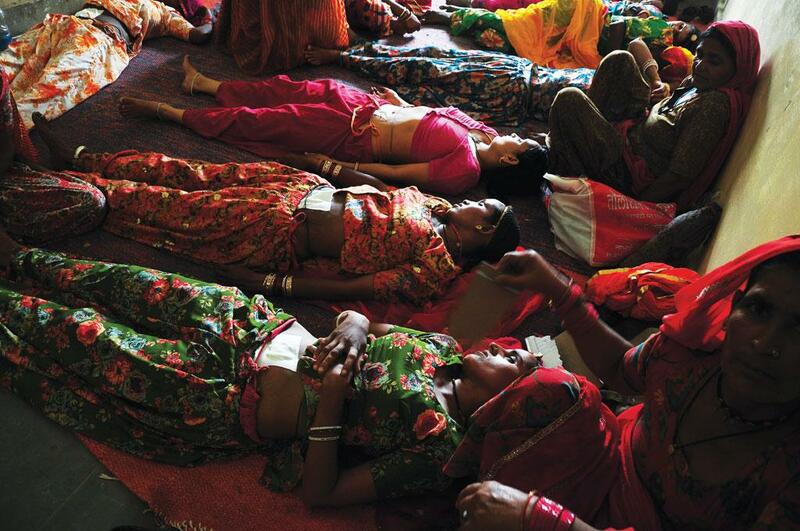 Besides, the rate of sterilisation failure in India could be much more than what the government claims—0.5 per cent. While there are several factors responsible for sterilisation failure, incomplete closure of the tubes because of medical negligence is a prime reason. Such medical negligences, lack of compassion towards patients and trans parency had prompted the apex court in 2016 to order the Union government to upload all data related to sterilisation, including complications, failures and claims paid, on the website of the National Health Mission (NHM). Though the Union Ministry of Health and Family Welfare has written letters in this regard to all the states, Jasodhara Dasgupta of Lucknow non-profit Sahyog says, barely a few have uploaded the details. And these details paint a grim picture of the country’s most popular method of contraception. In Uttar Pradesh, for instance, 286,932 women underwent sterilisation in 2016-17. That year, 203 women reported failure. Though Rajasthan is yet to upload the data on NHM website, response to queries under RTI (the Right to Information Act, 2005), by Prayas shows that 1,869 women reported failure in 2014-15; the figure was 2,086 the next year. Experts say the number of failed sterilisation cases could be much higher if one takes into account the unreported cases. “We came across 70 women with failed sterilisation from just a few villages in Rajasthan and Madhya Pradesh. Now do the maths!” says Pachauli. These “missing” cases would further delay the Union government’s population stabilisation target, which has already been pushed to 2070 from the initial 2045. Despite becoming the first country to adopt a national policy for population control, India is the world’s second most populated country and is predicted to overtake China by 2034 to take the top slot. There is an urgent need for the government to understand who are the ones undergoing sterilisation and frame policies to focus on their counselling. The next step is to introduce a mechanism under which health workers would keep a tab on those undergoing sterilisation and report in case of failure. This will not only help the family receive compensation without any delay but also help the government take corrective measures. For instance, sterili sing a man through vasectomy is a much simpler and effective procedure, but only a tiny fraction of men in the country’s patriarchal society opt for the method. It’s time the government infused new vigour in its programmes aimed at sensitising men for vasectomy and teaching poorly educated women in remote communities how to use pills or contraceptives. Devika says the government should also increase the compensation amount under FPIS to Rs 4-5 lakh, especially if the newborn is a girl. The article was first published in October 1, 2017 issue of Down To Earth magazine under the title "It is too late"